Too smart to get scammed? 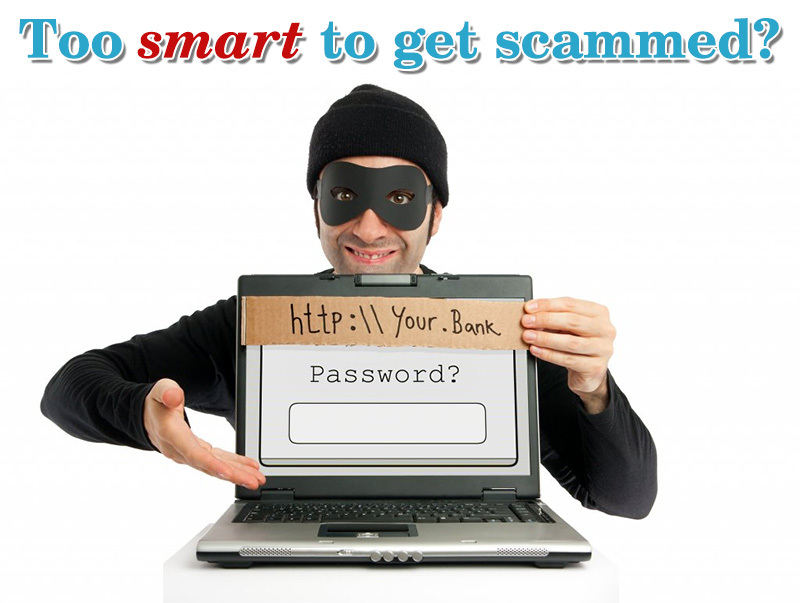 It’s a popular belief that only stupid and greedy idiots fall for scams or get scammed. Unfortunately, that’s just not the case in the real world! We regularly receive contacts from professors, doctors and lawyers and other ‘smart’ occupations asking for help or guidance. Being good at one thing doesn’t mean you’re good at everything, and spotting scams uses a very different set of skills than delicate surgery on a tumor, or researching into the incredible world of quantum physics. And we wouldn’t want it any other way, of course! Be great at what you do, don’t let pride make a mug of you! Thousands of intelligent people get scammed every day. I recently came across a case where a lawyer hadn’t done a thorough enough due diligence on another trusted lawyer, and deposited a huge amount of their clients money into the phony lawyer’s deposit account for a house purchase. They were lucky, they were insured, but you can bet their premiums spiraled after that little slip up. It only takes a short drop off attention, being tired or in a rush to make a misjudgment with great consequences. In fact, if anyone is ever rushing you to complete any financial transaction, always ask yourself why? Is it because they want to cash out before they get caught? Business owners receive phony invoices for fire inspections and advertising/directory entries regularly. People running companies keeping hundreds employed are leeched upon by scammers hoping the game invoices will go unnoticed and paid. Honest, diligent businessmen who like to pay their dues on time are abused this way. So you can see it’s not always greed that gets people in trouble, often it is trust and honesty. Indeed, one of the largest areas that scammers go hunting is the hearts of the lonely. People looking for a friend or companion get picked on as easy targets. They aren’t trying to take a deposed prince’s millions, they just want someone to bake for. A whole category of scammers (Romance Scammers) exist and thrive just because it’s easy for them to prey on these innocent and lonely people. These Romance Scammers definitely aren’t looking for greedy victims; they exploit normal people who are in search of someone else to share their life with. It is easy to become a victim without matching the stereotypical image of a greedy idiot. By all means, being greedy does tempt some people to ignore their gut instincts, but you can’t always rely on instinct alone. What can you do to check out a potential scam? Internet searches for similar situations can help hugely. Our friends over at scamwarners.com will always be happy to give impartial and completely free advice. They may not all be surgeons and professors, but they sure know their scams… let them help you find the truth in your case. ← Just when you thought you have found the love of your life.